Our J has always been a quiet, good-natured sort of little boy. He is boisterous and very curious, but he is not a risk-taker and is at his happiest playing around his parents. He is not one to go wandering off to have an adventure. 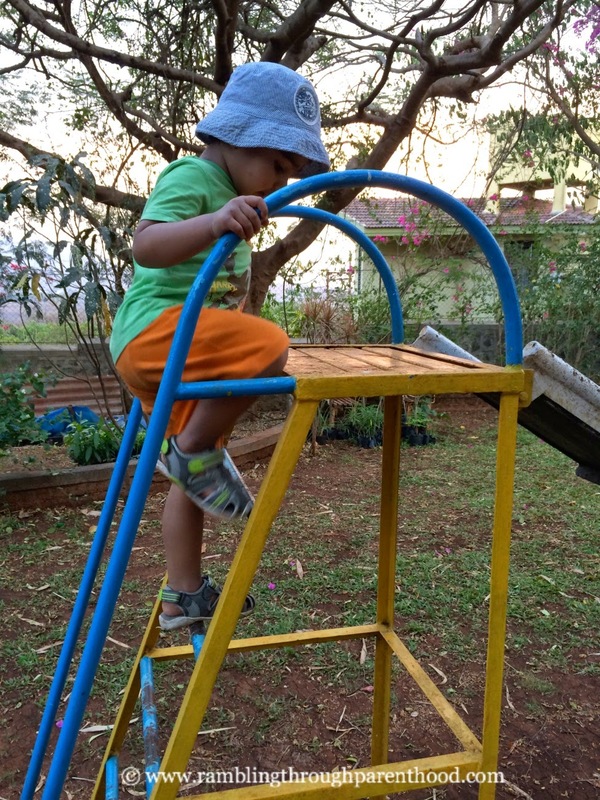 So it came as no surprise when J in his early days of toddlerhood, needed a lot of coaxing and encouragement to tackle even a couple of steps of a small garden slide. There was an incredible amount of initial resistance and reluctance. It was only when his best friend in the whole wide world was around that he would wander near a slide. We had not even ventured near a climbing frame at this stage, not even at soft play. And then one day last summer, something clicked. Maybe it was his new pair of shoes, maybe it was the sun radiating warm sunshine. Maybe it was just that my little J was coming out of his shell and showing me his true colours. The child was just around 2 years old when we had gone to our local park. With his best friend in the whole wide world. We did the swings, we did the roundabouts, we did the springy horse. The only apparatus that J had not bothered with was the climbing frame and slide. I decided the time had come to try and get him up that frame and down that slide. It wasn't so much a climbing frame as a series of steps leading to a little balance bridge that then led down the slide. All it took was a couple of tries with J holding on to my hands for a little bit of support. More emotional than physical support, I reckon. 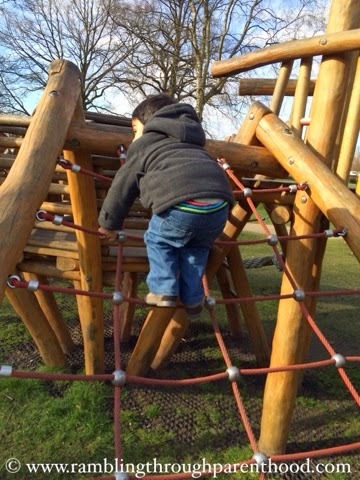 And before I could say up-the-climbing-frame, the child was off by his own brave self, pulling himself up one rung at a time, tackling the bridge one careful step after another. I have looked and searched, but unfortunately I do not have any photographic evidence of this marvellous achievement. I believe I was so ecstatic, I probably forgot to brandish my camera. Or maybe I was just flabbergasted by what I was witnessing. Or perhaps I had my heart in my mouth while my hands spread protectively around my adventurous little toddler as he hovered six feet above the ground on a rickety bridge. Whatever the reason, I have no evidence to support that incredible day at the park when J took his first steps up a climbing frame. I have not made the same mistake again. Over the last year, J has steadily become more adventurous. We have long since left the toddler parks behind. We now frequent the big-kid play areas and have a go at mastering the more challenging climbing frames. In March this year, J tackled a rope frame for the very first time. And I managed to capture it on camera. The child has the climbing agility of a little monkey. And the same cocky confidence to match! 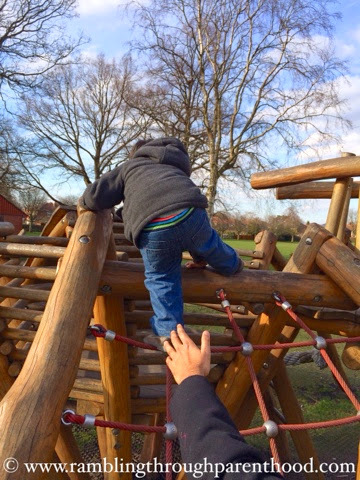 Just a couple of attempts with a parent for support, and he insists on going about the climb all by his own independent self. And manages to hum a tune as he does it. And stops half-way up to admire the view. It does not stop there. J has taken his frame climbing to an international audience. 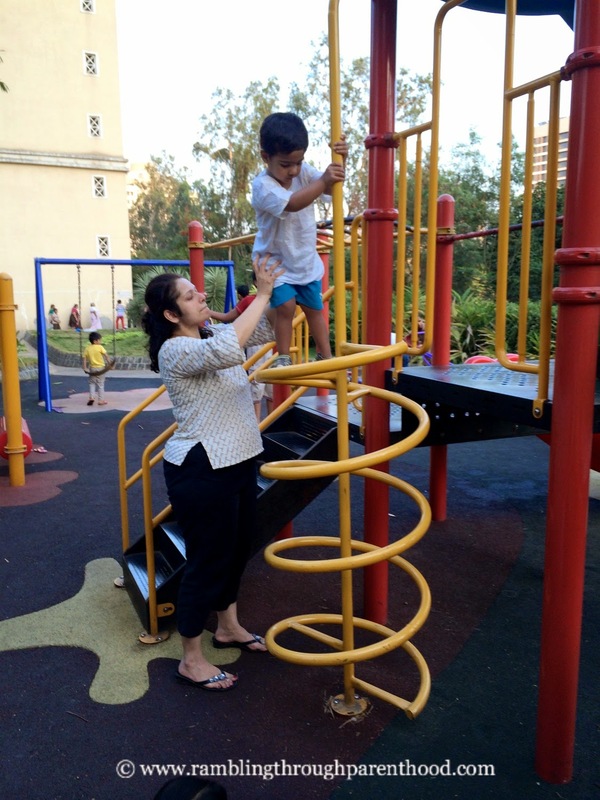 On our recent visit to India, he stunned his Aaji (Grandma) and Great-Uncle when he tackled a 7-foot slide by himself. And then he climbed up a curly-wurly climbing frame, pulling himself fastidiously up each spiral level to jump onto the slide platform. Last week we were on holiday in Majorca. You would have thought there was enough there to keep J occupied. The child still managed to spend an afternoon in the park doing what he does so effortlessly these days. 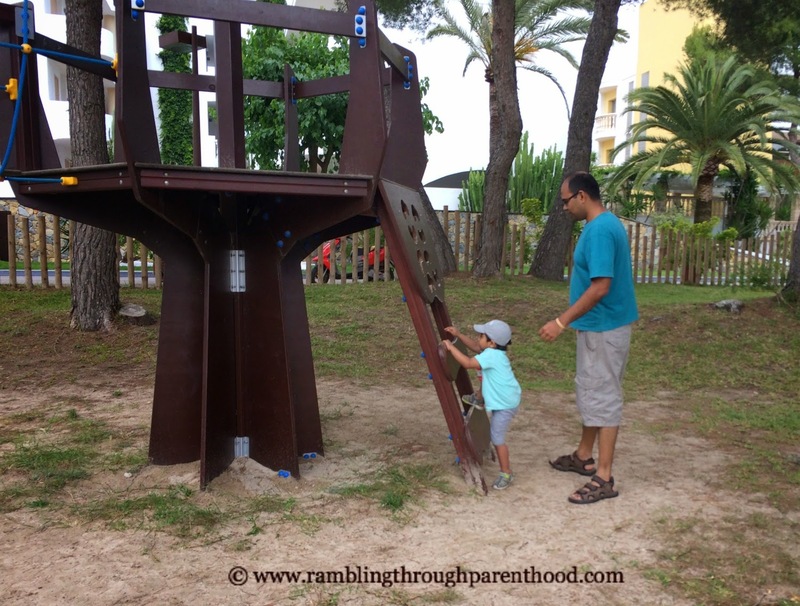 Climb up a climbing frame! A budding gymnast in the making, you reckon? My two have never needed any encouragement with climbing! It scares me that they have always been so proficient! Hasn't he done so well! it really sounds like he's taken that leap of faith, well done J! that's brilliant he's doing so well, you must be so proud. Its so lovely to see your childs confidence grow. Beautiful proud moments for parents. It's great he's growing in so much confidence. Climbing is great fun and he looks brilliant at it! It's great that he's so confident :) Ella loves climbing, I hate watching because my heart goes in my mouth! Definitely a natural climbing and doing so well tackling new equipment with confidence. Thanks for linking up and sharing J's fun with Country Kids.